Two weeks ago I had the unique opportunity to dine at the Nation's best culinary school, The Culinary Institute of America. I have wanted to see the campus and eat in their restaurants since reading Michael Ruhlman's book The Making of a Chef, which I have written about in a previous post. My family and I were in Rhinebeck, NY for an antique show that we do annually. I figured that we ought to make it a point to go to the CIA for dinner given that it is only 6 miles away. 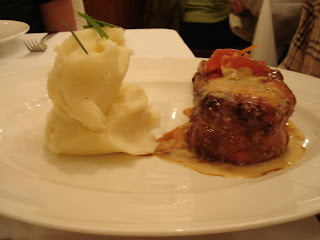 This is an account of our meal at the American Bounty, their award winning America cuisine restaurant. To start, the Greystone Campus of the CIA has a winemaking program. Each of the student-run restaurants offer those wines, so we ordered their Merlot, along with a Pinot Noir to pair with the anticipated entrees. 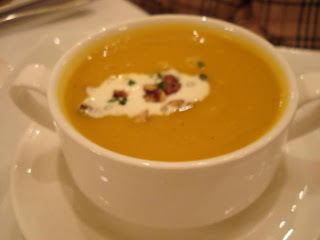 The menu, which can be viewed on the website for the American Bounty, is rich food with big flavors. 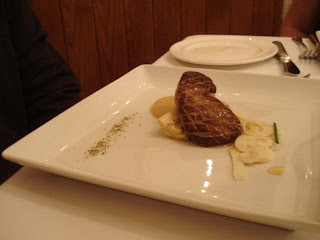 I began the meal as any Hudson Valley meal should, with Foie Gras. It was prepared with shaved fennel, grilled artichoke heart, and a caramelized onion sauce. Now, for those of you who have not had Foie Gras before, it can best be described as rich, buttery, and, if seared properly, crispy on the outside. My wife had a crab cake appetizer that was served with a vanilla bean cole slaw and a Louisiana-style remoulade. We also ordered a seared scallop dish that was served with crispy pork belly and a smoky tomato sauce. 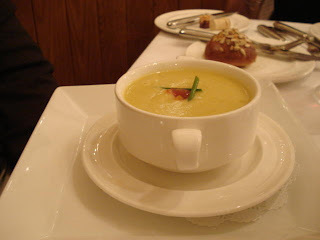 The second was a sweet corn chowder. It was not a traditional chowder with chunks of goodness, but rather a creamy soup. 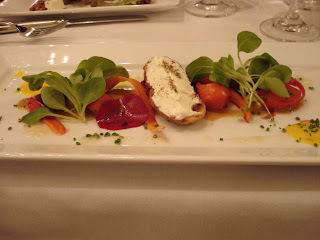 The ladies had salads, this one with roast beets, goat cheese, pinenut butter, and sherry-honey vinaigrette. 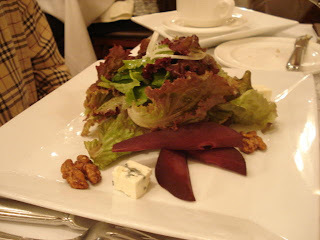 The second salad was a country salad with wine poached pears, blue cheese and spiced walnuts. The entree selection was not huge, and surprisingly, no steak option was offered, unless you include a BBQ beef sparerib as steak, which I would not. We chose three options so that we all might taste and share. 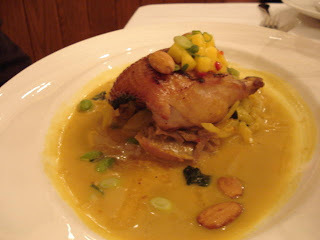 I chose smoked duckling served in a curried almond sauce, and preserved mango. There was also a double cut Berkshire Pork chop served with ginger tomato jam, spicy mustard and a mound of garlic mashed potato. And last, there was a dish that I had never had. It was a Maine Lobster burgoo. Now a burgoo is traditionally a meat stew made with some type of game or lamb. It was a peasant dish that began in Ireland or Scotland, much like Brunswick Stew. Here, it was a broth that was used as a sauce. 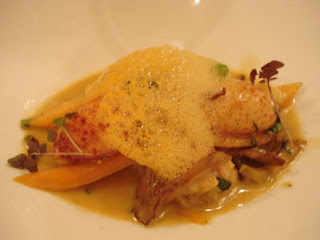 The lobster claws were served over roasted veggies, lima beans, chanterelle mushrooms, and a carrot froth. It was rich, clean, and focused- a really great dish. As if all of that was not enough, of course we had dessert. 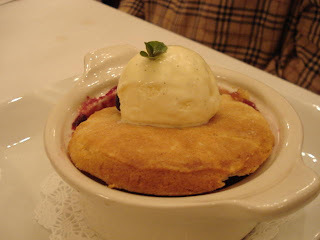 We chose an off-menu berry buckle with a shortbread cap served with vanilla ice cream. 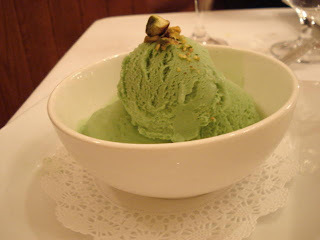 I had a serving of pistachio ice cream, something that I love to eat any time of day, and this was good! 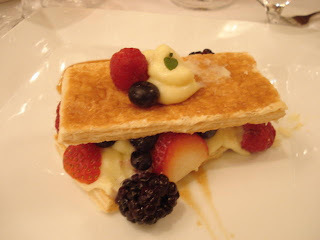 There was also a neapolitan with puff pastry, a ricotta filling, and berries. We also had an assortment of dessert drinks. We tried the pumpkin spice cappuccino, an almond latte and a Late Harvest Vignoles from the Finger Lakes (this is a sweet wine made from grapes that are left on the vine until very late into the fall). SO, overall, we had a great meal. It is an experience that I would recommend for anyone who wants to see the place where more top chefs have been trained than anywhere in the nation. The service is shaky, but keep in mind that the servers are culinary students who do not have front of the house experience. For more information about the restaurants at the culinary institute, go to their website at www.CIAcheff.edu. Nice job on this blog, Kris. Although, a little brief - to the point. A very delicious experience enjoyed by all. But your lamb chops, oooh so good!